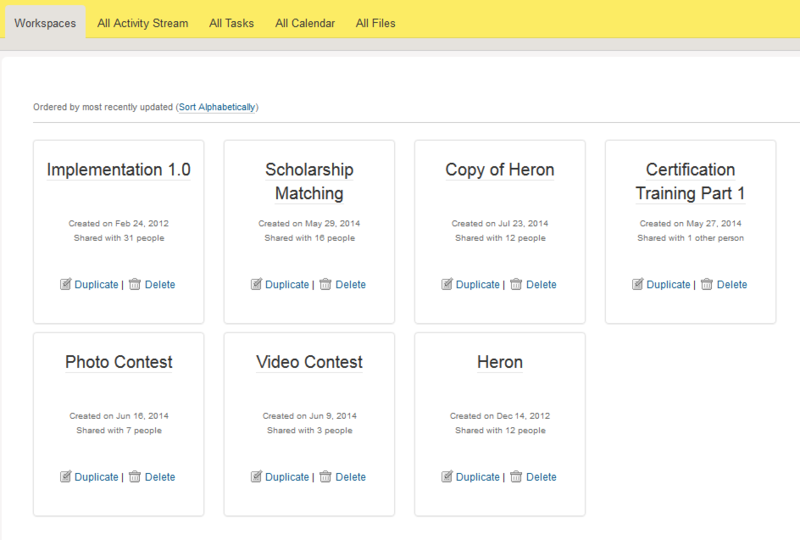 The Workspaces that you are member of will show on the Dashboard at the My WizeHive level. You can also search for a Workspace. When you first enter the My WizeHive Dashboard, workspaces you are a member of will appear in the order most recently updated. If you click on 'Sort Alphabetically' the list of Workspaces will be alphabetized. If you then click on 'Sort by most recently utilized' the list will be sorted by Workspaces most recently used again. To the right of the Workspace name you will see options to " Duplicate" and "Delete". If you select "Delete" you will see a confirmation box depending on the type of user you are in that Workspace. If you are an administrator of a Workspace the delete option will allow you to permanently delete the Workspace. It will remove it for you and anyone you may be sharing it with. If you are not an administrator for the Workspace you may not delete the workspace fully, but you can remove it from your account. Once you do this you will no longer have access to the information within this Workspace.